The invention provides a polishing-free PE (polyethylene) white primer. 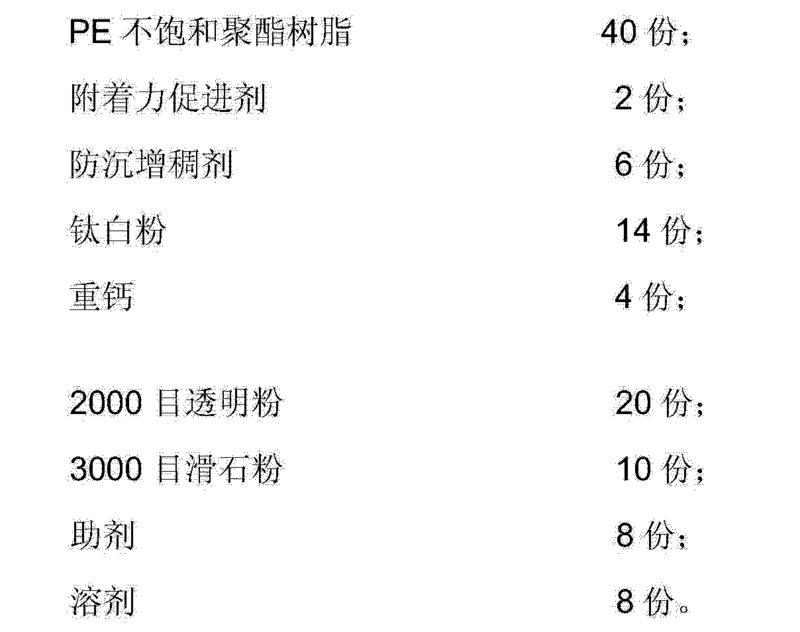 The polishing-free PE white primer is prepared from the following components in parts by weight: 30-60 parts of PE unsaturated polyester resin, 2-5 parts of adhesion promoter, 2-6 parts of anti-settling thickening agent, 10-20 parts of titanium dioxide, 4-12 parts of triple superphosphate, 5-20 parts of transparent powder, 5-10 parts of talcum powder, 2-8 parts of auxiliaries and 2-8 parts of solvent. The polishing-free PE white primer has high paint film fineness, strong adhesion force among coatings and good smoothness, and can reduce the labor cost, shorten the production time and improve the production efficiency due to removal of the polishing procedure. 本发明涉及涂料领域，尤其涉及一种省打磨的PE白色底漆及制备方法。  The present invention relates to the field of coatings, and more particularly to a white base paint PE province polished preparation method. 随着实木家具的再度兴起以及木质材料在室内装修材料中所占比例的日益增大，家具和室内涂装对高档涂料的需求也是日益扩大，以期获得高质量高品质的装饰效果。  With the re-emergence of solid wood furniture and wood-based materials in increasing the proportion of interior decoration materials, furniture and interior painting demand for high-grade paint is also growing, in order to obtain high-quality high-quality decorative effect. 而国内木器用高档涂料主要有聚氨酯漆(PU漆)和聚酯漆(PE漆)两大类。 Wood coatings with high-grade domestic main polyurethane paint (PU paint) and polyester paint (PE paint) two categories. 漆一般是由异氰酸酯预聚物(也叫低分子氨基甲酸酯聚合物)和含羟基树酯两部分组成，通常称为固化剂组分和主剂组分，漆膜强韧、光泽丰满、附着力强、耐水耐磨、耐腐蚀性。  The paint is generally an isocyanate prepolymer (also known as low-molecular urethane polymer) and a hydroxyl group-containing resin composed of two parts, typically referred to as a main component and the curing agent component, tough film, Full gloss, adhesion, water resistance wear and corrosion resistance. PE漆，由主剂、促进剂、引发剂三者相互调合进行聚合架桥反应而固化，其溶剂可以为苯乙烯,成膜时参与反应。  PE paint, the main agents, accelerators, initiators three mutually blending crosslinking polymerization curing reaction, which solvent may be styrene, participating in the film formation reaction. 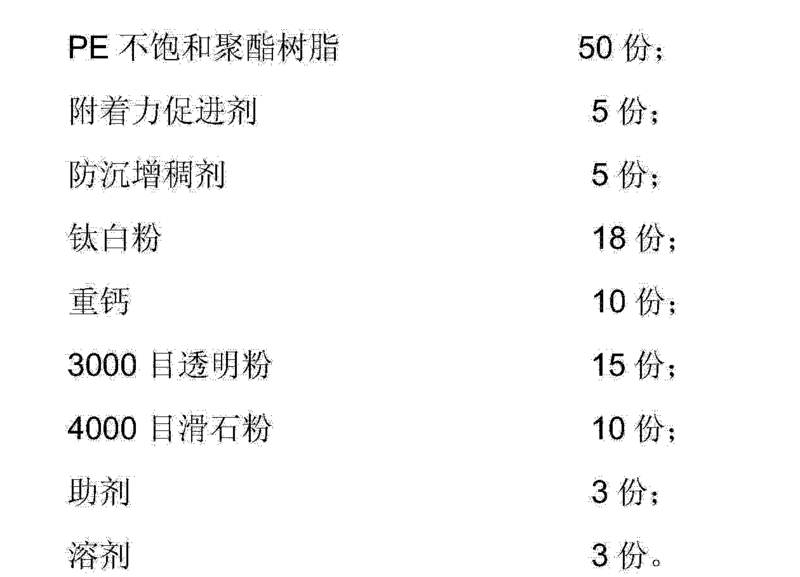 与PU漆相比，PE漆的优点是具有“ 100%的反应能力”，这意味着液态组成物能在引发剂的作用下，没有副产物释放出来而能全部转变为固态聚合物。  Compared with the PU paint, the advantages of having a PE paint "100% response capability", which means that the liquid composition can be in the role of initiator, no by-product can be released and the complete conversion of solid polymer . 而PU漆却需要大量溶剂挥发后，才能形成漆膜，这样的漆膜并不像树脂固化成型那样坚硬，且溶剂的挥发造成了一定的环境污染，和给施工人员也带来了健康的损害。 And it takes a lot PU paint after solvent evaporation, to form the film, this film is not as hard cured resin molding, and solvent evaporation caused some environmental pollution, and to construction workers also brings health damage . 另外PE漆可一次成型较厚的漆膜，封孔性好，丰满度高；在耐磨、耐热、耐腐蚀、高光泽等方面与PU漆相当；在硬度、丰满度、透明度、填充性等方面也具有优秀的性能。 Further PE paint may be a thick film forming, good sealing fullness; PU paint comparable in wear resistance, heat resistance, corrosion resistance, high gloss, etc. ; hardness, fullness, transparency, filling and so also has excellent performance. 但是，目前大多数家具厂商在生产家具时，仍是使用污染较大的I3U白色底漆，这是因为I3U白底漆可以不经过打磨直接干燥后涂装面漆，如中国专利CN102977761A公布了一种由短油醇树脂，溶剂和填料构成的`PU底漆。  However, most furniture manufacturers in the production of furniture, is still using contaminated large I3U white primer, because I3U white primer may not be polished directly after drying paint finishes, such as Chinese patent CN102977761A published `PU primer constructed by a short oleyl alcohol resin, a solvent and a filler. 而PE白色底漆直接作用在家具上，一般要经过打磨抛光后才能得到丰满度和硬度较好的涂层，使用PE白色底漆喷涂家具工艺复杂，占用大量时间，从而生产效率低，而且附着力也往往达不到要求。 White base paint and PE act directly on the furniture, generally after polished to get better fullness and hardness of the coating, the PE white primer spraying furniture of the complex, take up a lot of time, whereby production efficiency is low, and adhesion force are often below standard. 本发明的目的是在于克服上述不足，提供一种省打磨的PE白色底漆。  The object of the present invention is to overcome the above deficiencies, to provide a white base paint PE province polished. 其中，所述附着力促进剂选自氨基硅烷、改性聚丙烯酸化合物、氯化聚烯烃、环氧基硅烷任意一种或几种。  wherein the aminosilane adhesion promoter is selected, polyacrylic acid compound-modified, chlorinated polyolefin, an epoxy group or any one of several silane. 其中，所述防沉增稠剂选自有机膨润土、蓖麻油衍生物、改性氢化蓖麻油或气相二氧化硅中任意一种或几种。  wherein the thickener is selected from an anti-settling organic bentonite, any one or more of castor oil derivatives, hydrogenated castor oil-modified silica or fumed. 其中，所述钛白粉选自金红石型钛白粉或锐钛型钛白粉，更优选地，所述钛白粉为金红石型钛白粉。  wherein the selected titanium dioxide or rutile titanium dioxide anatase titanium dioxide, and more preferably, the titanium dioxide is rutile titanium dioxide. 其中，所述助剂选自湿润剂、消泡剂、乳化剂、分散剂的任意一种或几种。  wherein the auxiliary is selected from wetting agents, any one or more antifoaming agents, emulsifying agents, dispersing agents. 优选地，所述消泡剂选自聚醚改性有机硅消泡剂。  Preferably, the defoaming agent is selected from polyether-modified silicone defoamer. 其中，所述溶剂为苯乙烯、醋酸丁酯、醋酸乙酯中的任意一种或几种，优选地，所述溶剂为苯乙烯。  wherein the solvent is styrene, butyl acetate, ethyl acetate or any one of several, preferably, the solvent is styrene. 优选地，所述填料包含重钙、透明粉、滑石粉，以所述省打磨的PE白色底漆重量计，所述重钙为4-12重量份、所述透明粉为5-20重量份、所述滑石粉为5-10重量份。  Preferably, the filler comprises TSP, transparent powder, talc, polished to save the weight of PE white primer, the TSP is 4-12 parts by weight, the transparent powder 5- 20 parts by weight, 5-10 parts by weight of the talc. 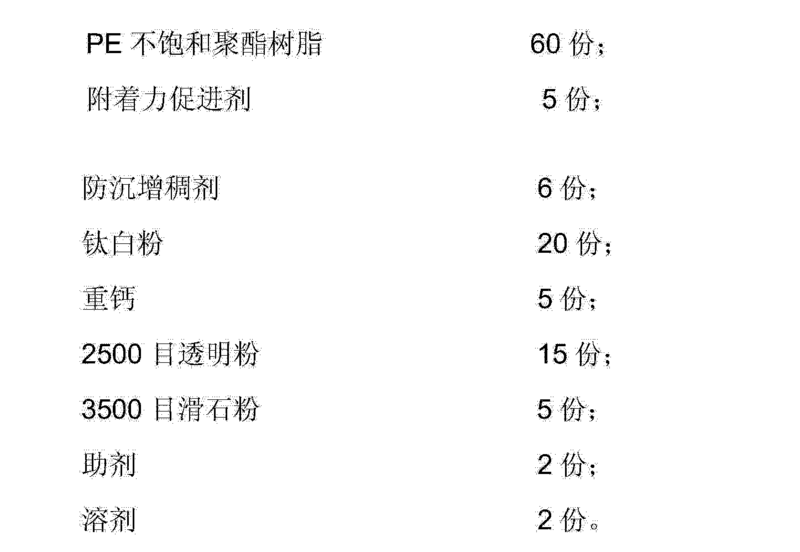 其中，所述透明粉的细度为1000-4000目，更优选地，所述透明粉的细度为2000-3000 目。  wherein the transparent fine powder of 1000-4000 mesh, more preferably, the transparent powder fineness of 2000-3000 mesh. 其中，所述滑石粉的细度为2000-4000目，更优选地，所述滑石粉的细度为2500-3500 目。  wherein said talc mesh fineness of 2000-4000, and more preferably, the fineness of talc 2500-3500 mesh. 研磨至细度小于等于30nm，制得所述省打磨的PE白色底漆。  The fineness of grind smaller than or equal to 30nm, the province polished to prepare white primer PE. 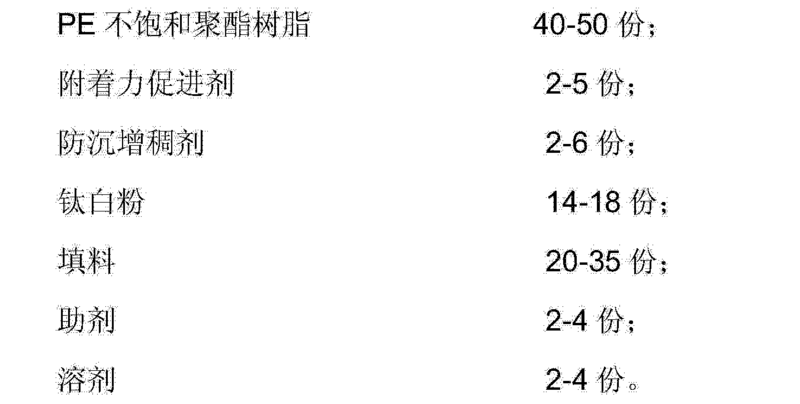 优选地，所述分散时间为20-30分钟。  Preferably the dispersion time is 20-30 minutes. 优选地，所述细度小于等于25nm。  Preferably, the fineness of less than or equal 25nm. 本发明的有益效果为:所述省打磨的PE白色底漆的漆膜细腻度、涂层之间的附着力强，平整性好，减少了打磨这一工序，降低了人工成本，缩短了生产时间，提高了生产效率。  Advantageous effects of the present invention are: the delicate film of PE province polished white primer, intercoat adhesion strength, good flatness, the grinding step is reduced, reducing the labor costs, shorten production time and improve production efficiency. 下面结合具体实施例对本发明做进一步说明，但不限定本发明的保护范围。  The following Examples with reference to specific embodiments of the present invention is further illustrated, but not limit the scope of the invention. 通过三辊机研磨至细度为30nm，制得所述省打磨的PE白色底漆。  by a three-roll mill ground to a fineness of 30nm, to prepare the province PE polished white primer. 通过三辊机研磨至细度为15nm，制得所述省打磨的PE白色底漆。  by a three-roll mill ground to a fineness of 15nm, to prepare the province PE polished white primer. 通过三辊机研磨至细度为20nm，制得所述省打磨的PE白色底漆。  by a three-roll mill ground to a fineness of 20nm, to prepare the province PE polished white primer. 通过三辊机研磨至细度为20nm，制得所述省打磨的PE白色底漆。  by a three-roll mill ground to a fineness of 20nm, to prepare the province PE polished white primer. 本发明所述省打磨的PE白色底漆的漆膜细腻度好，连续涂装底漆后，省去打磨工序，直接施工喷涂面漆，测试附着力，附着力可达I级(参照GB/T9286标准)。  Good delicate film of the present invention, the PE province polished white primer, the primer coating after the continuous, eliminating the grinding step, direct construction topcoat, adhesion test, the adhesion up to level I ( Referring GB / T9286 standard). 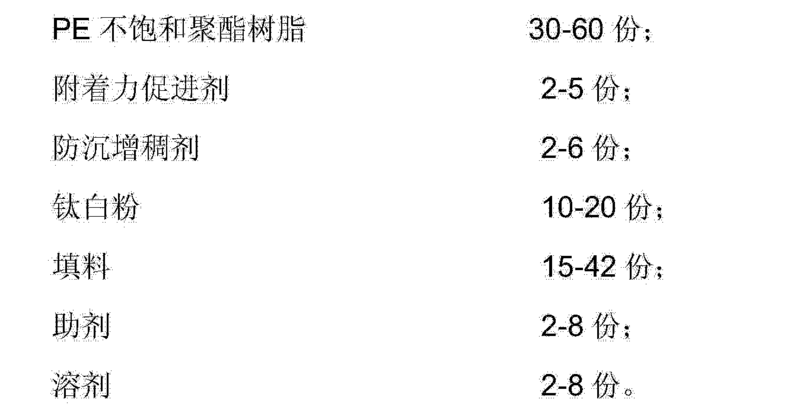 由于省去打磨工序，也减少了生产时间，降低了人工成本，大大提高了生产效率。 Since eliminating the grinding step, also reduces the production time, reduce labor costs and greatly improve production efficiency. 以上对本发明的具体实施例进行了详细描述，但其只是作为范例，本发明并不限制于以上描述的具体实施例。  The foregoing specific embodiments of the present invention has been described in detail, but just as an example, the present invention is not limited to the specific embodiments described above. 对于本领域技术人员而言，任何对本发明进行的等同修改和替代也都在本发明的范畴之中。 To those skilled in the art, any equivalent modifications and alternatives to the present invention are also in the scope of the invention. 因此，在不脱离本发明的精神和范围下所作的均等变换和修改，都应涵盖在本发明的范围内。 Thus, variations and modifications made to uniformly without departing from the spirit and scope of the present invention, shall fall within the scope of the present invention. 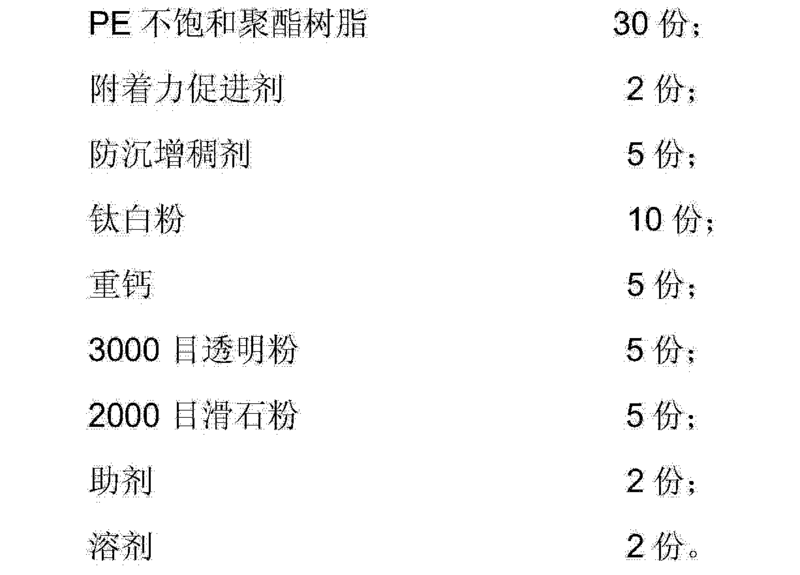 3.根据权利要求1所述的省打磨的PE白色底漆，其特征在于，所述填料包含重钙、透明粉、滑石粉，以所述省打磨的PE白色底漆重量计，所述重钙为4-12重量份、所述透明粉为5-20重量份、所述滑石粉为5-10重量份。 The province PE polished white base paint according to claim 1, wherein said filler comprises TSP, transparent powder, talcum powder, to save the polished white primer PE weight, the weight 4-12 parts by weight of calcium, the transparent powder 5 to 20 parts by weight, 5-10 parts by weight of the talc. 4.根据权利要求3所述的省打磨的PE白色底漆，其特征在于，所述滑石粉的细度为2500-3500 目。 4. The PE province polished white base paint according to claim 3, wherein said talc mesh fineness of 2500-3500. 5.根据权利要求1所述的省打磨的PE白色底漆，其特征在于，所述附着力促进剂为氨基硅烷、改性聚丙烯酸化合物、氯化聚烯烃、环氧基硅烷任意一种或几种。 The province PE polished white base paint according to claim 1, wherein the aminosilane adhesion promoter, polyacrylic acid compound-modified, chlorinated polyolefin, or any one epoxysilane several. 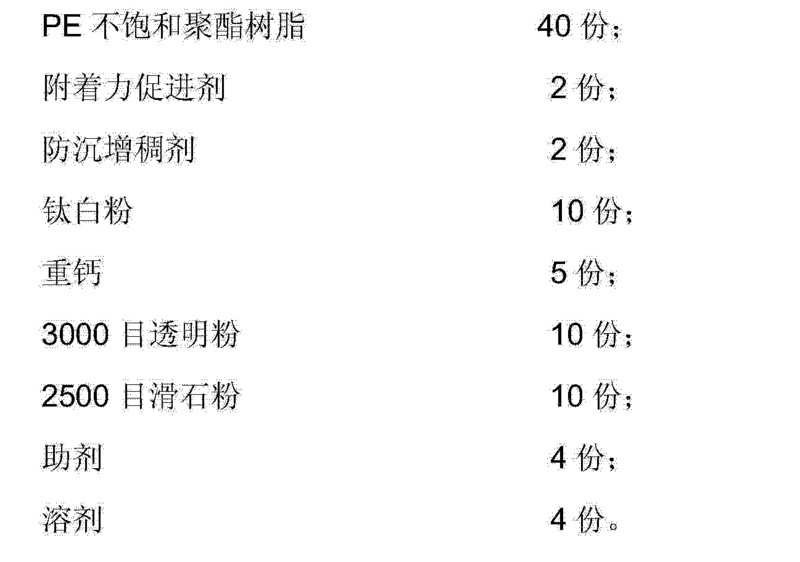 6.根据权利要求1所述的省打磨的PE白色底漆，其特征在于，所述防沉增稠剂为有机膨润土、蓖麻油衍生物、改性氢化蓖麻油或气相二氧化硅中任意一种或几种。 6. PE province polished white base paint according to claim 1, wherein said anti-settling thickener is organic bentonite, castor oil derivatives, hydrogenated castor oil or modified in any of a fumed silica one or several. 7.根据权利要求1所述的省打磨的PE白色底漆，其特征在于，所述钛白粉为金红石型钛白粉或锐钛型钛白粉。 7. PE province polished white base paint according to claim 1, wherein said titanium dioxide is rutile type titanium dioxide or anatase titanium dioxide. 8.根据权利要求1所述的省打磨的PE白色底漆，其特征在于，所述助剂为湿润剂、消泡剂、乳化剂、分散剂的任意一种或几种。 8. The PE province polished white base paint according to claim 1, characterized in that the auxiliaries are wetting agents, any one or more antifoaming agents, emulsifying agents, dispersing agents. 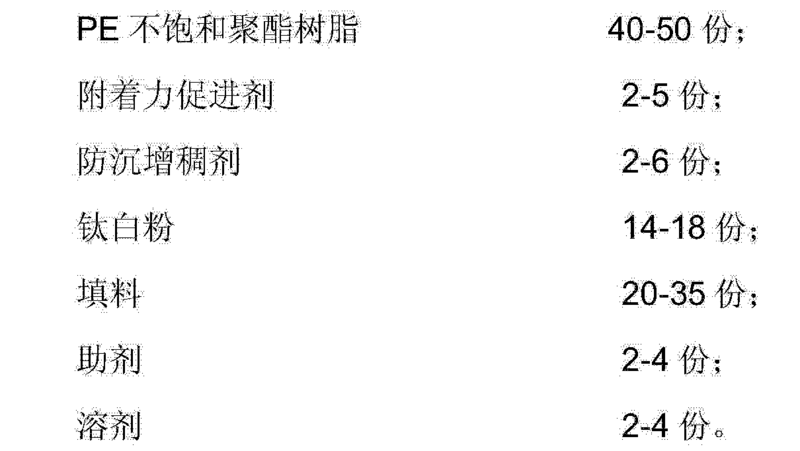 9.一种制备权利要求1-8任意一项所述的省打磨的PE白色底漆的方法，其特征在于，包括步骤: 按重量份数添加所述的省打磨的PE白色底漆各组分并混合，在1200-1400转/分钟的速度下分散时间为15分钟以上； 研磨至细度小于等于30nm，既得所述省打磨的PE白色底漆。 The method of saving the white base paint sanding PE 1-8 9. A preparation as claimed in any one of claims, characterized by comprising the steps of: adding parts by weight of PE province polished white base paint according to the groups minutes and mixed at 1200-1400 revolutions / minute speed dispersing time was 15 minutes; ground to a fineness of 30 nm or less, the province acquired PE polished white primer. 10.根据权利要求9所述的制备省打磨的PE白色底漆的方法，其特征在于，所述分散时间为20-30分钟。 PE 10. The method of preparing the white base paint of the province of grinding according to claim 9, characterized in that the dispersing time was 20-30 minutes.